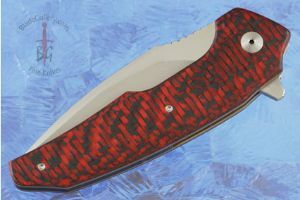 Description: South African knifemakers André Thorburn and André van Heerden create exceptional folders at a tremendously high skill level. When they collaborate together, they make A2 knives. 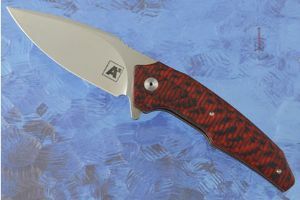 This knife is a miniature version of the standard A6 making it a much more carry-friendly version! 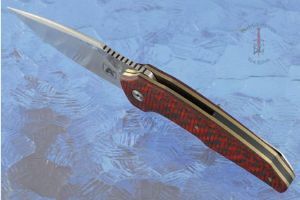 The blade is perfectly centered and the action is silky smooth -- easily opened with one hand using the discreet and ambidextrous flipper toggle. The blade uses the IKBS (Ikoma Korth Bearing System) pivot system. This mechanism, which was originally designed to fit balisong knives, uses ball bearings to create exceptional action with no blade play. Thorburn and van Heerden created this special A6 Mini with ceramic ball bearings. Generally IKBS bearings are made either from tool steel or from stainless steel. Stainless steel can wear away, resulting in uneven action over time. Tool steel bearings can oxidize making the action rough. Ceramic bearings are the best of all worlds. Extremely hard and wear resistant, they are also inert and will not oxidize. The blade is formed from M390 premium stainless steel. 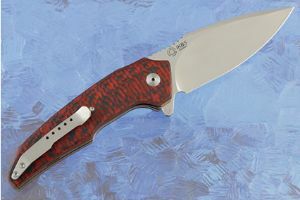 M390 is a super-steel created by Bohler in Austria. It takes an incredibly sharp edge and holds on to it due to its high concentration of vanadium and chromium carbides. Its unique powder metallurgical process also promotes a uniform carbide distribution and clean steel properties, making M390 a popular steel used in surgical cutting instruments and in applications requiring a high finish. It offers excellent corrosion resistance due to its high concentration of chromium. The blade is hollow ground for an easy to maintain edge. 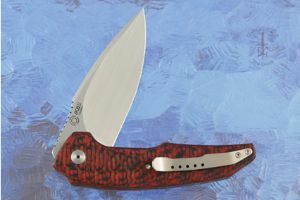 Handle scales are formed from red carbon fiber. Jimping on the thumb ramp aids grip. The gently rounded handle feels sturdy and fills out the hand perfectly. It is completed with bronze anodized titanium liners. The ultra-light titanium pocket clip is mounted for tip-up, right-handed carry.